It's true -- I studied French all through high school, participated in several exchange programs during my high school summers, minored in French in college, and try to speak French whenever I can. The first time I went to Paris, it felt so familiar -- I was sure I had lived there in a prior life. And considering how quickly I picked up the language, I was even more convinced. (Sadly, I have not had the same success learning Spanish, despite our many trips to Guatemala!). And I love this quote, which translates as: Love belongs to those who think about love. The woman is from a magazine ad that I cut out. I was drawn to her elegance, but also to the mischievous smile on her face. I painted with acrylic ink to alter her, and gave her some bling with my Viva glitter pen. I collaged a part of a map of Paris, and of course you recognize the Eiffel tower! 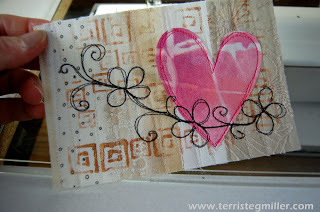 The paper for the hearts were created using my gelli plate. 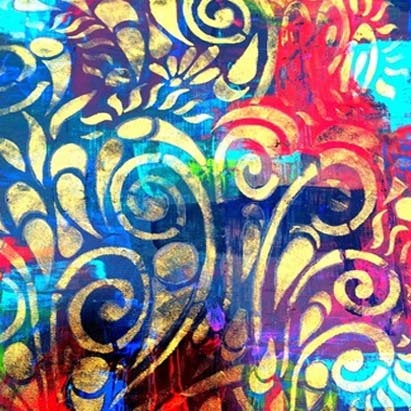 The gold swirls are painted with my new favorite toy, a Krink bold tipped ink pen! Have you ever traveled somewhere and felt like you belonged there? Is there a particular language (not your native one) that feels familiar on your tongue? Do you believe in past lives? Let me know! 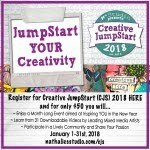 Linking to: City Crafter (it's a small world), Happy Daze (love is all around), and Try it on Tuesday (at least one heart). PS: Check out this great tutorial for making quilted valentine's day postcards by Terri Stegmiller using my Random Squares stencil. Thanks Terri -- I'm thrilled! adorable - especially this french collage is stunning Jessica ! Fab! Absolutely -- I have felt this way about many cultures! Magnifique! Beautiful work as always Jessica! I especially love the eyes on your face - gorgeous!!! Elegant she is! 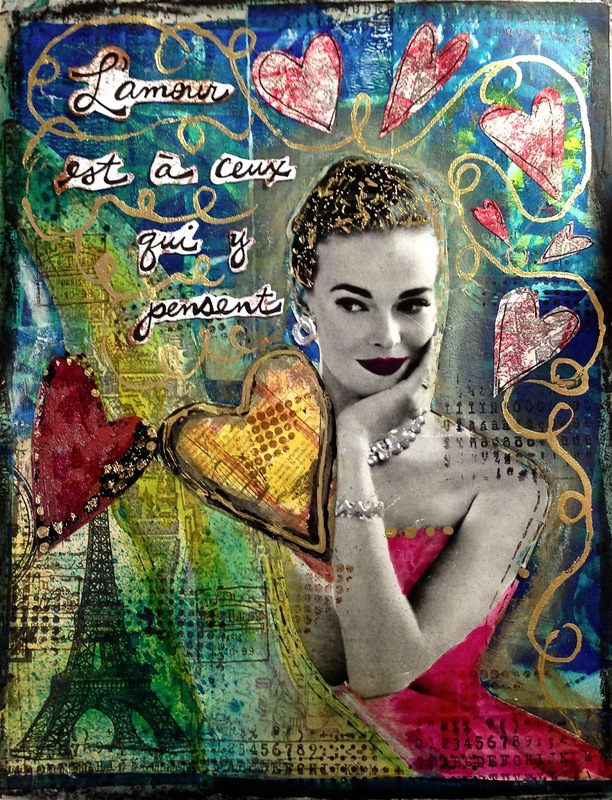 I love that you used some of your Gelli prints i this too. I think we all need Gelli club to show different ways to use our prints :) Your face 4 is fabulous! It's hard to do a face looking like backwards like that! Great Job! Thanks for the link Jessica. I love your Random Squares stencil design. Wonderful page ... so detailed!!! Thanks so much for playing along at CCCB! Well, by the time you finish this challenge your faces will be perfect! You're well on your way! Beautiful ~ so romantic and elegant! I haven't found the place I feel as if I know from a prior life, but I know places like that exist. It might be France for me, but I've never been there! I took French in elementary and high school, but not in college. Still, even though I was exposed to Spanish while living in southern California, I still have a better understanding of French. Could be just from being exposed to it at a young age though. Kids pick up languages so much easier than adults :) I love the intense coloration in your piece, and the fanciful hearts! I just adore this.. I does look amazing. Thanks so much for playing along with us over at CCCB! Oh my, your girl is gorgeous. Love all the detail and texture in it!!! Oh wow, that is gorgeous, thanks for sharing it with us at CCCB! Hey now.. great face. You definitely have some brewing inside of you. Just beautiful. I always wanted to to to Paris. I loved that movie "Midnight in Paris". The golden colors, the time it took place in. Ah oui. 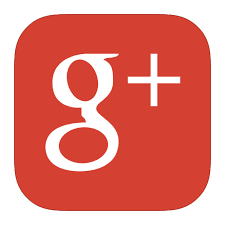 I love your work Jessica and I found your blog via Jenni. Marvelous work, beautiful texture and so many details. Gorgeous works, Jessica. I got to visit Paris (after a lifelong dream to) last year with my husband and loved every second of it1 so your first page really touched me. And I really like the eyes on your face #4! So pretty! Love all of these projects. 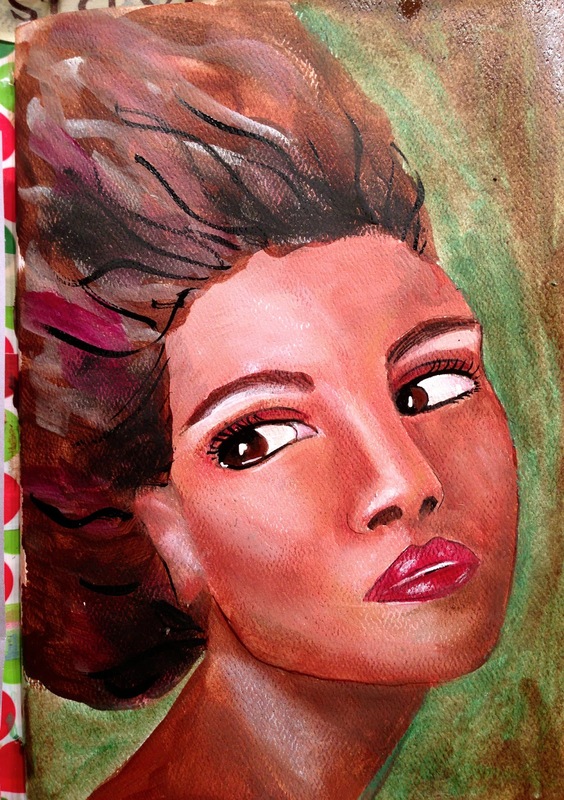 Faces are so difficult to paint, I think you are doing a great job! Great artwork, so much to look at all flowing beautifully. I dont make anything French inspired as I dont have good memories of France, but you have captured the feel perfectly. I love all of this, but I would have to say that the very first is my absolute favorite! I LOVE the layers, textures; practically everything about it! She's fabulous! Saw this on FB the other day and have been dying to come check it out. Love how you captured that mischievous smile and carried the feel out to your whole page. Lovely! This is a fabulous collage. Love all the layers and the background stamping gives such depth. Hi Jessica...I hope it's OK - I have posted one of your gorgeous images on my Facebook Page...@allthingsfrench, with a link to this blog, of course. If that is not OK, contact me and I will remove it, of course. What do you think? I thin your work is beautiful. I certainly DO feel a connection with France that I cannot explain...special. Thank you! Hope it's OK, Jessica...I have posted your image onto my Facebook account www.facebook.com/allthingsfrench, with credit and a link to this blog, of course. Let me know if you want me to remove it and of course I will. I, too, feel a special connection with la France - always. Thank you!